Premiering this past January at the Sundance Film Festival the musical family journey Hearts Beat Loud directed by Brett Haley and starring Nick Offerman will be hitting theaters this Friday. This being the big blockbuster summer season it is refreshing to come across films like this. Taking place in Brooklyn, New York Nick plays Frank Fisher a widowed record store owner and father to his daughter Sam played by Kiersey Clemons. The film is set the summer before Sam is to leave for the West Coast and start attending UCLA for pre-med. Frank mentions “she out grew me” and is left contemplating what life will be like without his daughter. On top of this in the age of digital Frank is forced to close his record shop after seventeen years. As I said this film was refreshing but not for the reason listed above. Frank and Sam have a tradition of doing jam sessions and with time winding down on being together Frank makes it a point for his daughter to participate. What happens during this time is such a sweet, endearing and collaborative moment between father and daughter. 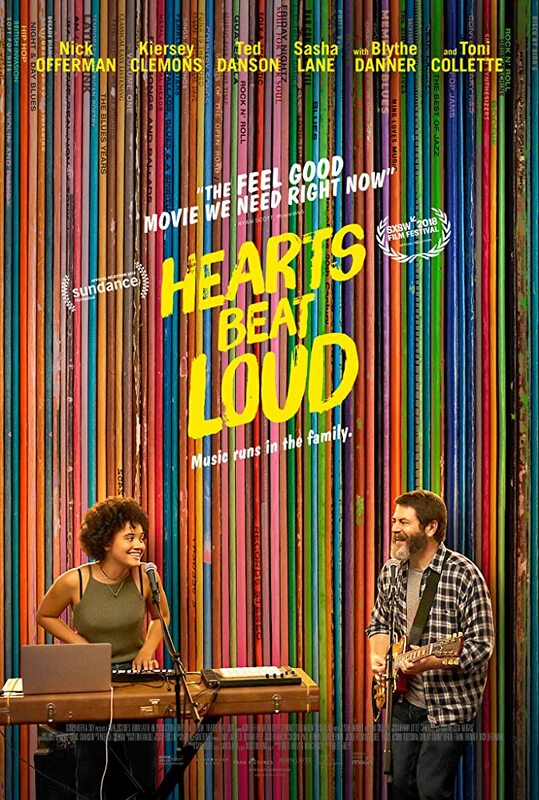 With the unrecognizable, raw talent of his daughter and Frank’s musical ambition they produce the song “Hearts Beat Loud” which Sam wrote about her mother. What could have been a cliché story instead focuses on these characters and the spiritual journey each takes; in this form of storytelling is where the film finds its own voice. Also starring Blythe Danner (Meet the Parents), Toni Collette (Little Miss Sunshine) and Ted Danson (Bored to Death, The Good Place) the film is not short on top notch talent. They each character wise provide the depth that when watching this film does not feel out of place or put there for “film purposes” but rather as actual people in Frank’s life; much like in real life how we are shaped and aided by those around us. Danson especially just feels right for the role of Frank’s friend Dave who coincidently is a bartender ala his days as Sam Malone from Cheers. There is also Sasha Lane (American Honey) who plays Sam’s girlfriend Rose and although her screen time is limited she shines in her scenes with Kiersey; I do not feel like Sam grew up until she met Rose. Rose offers Sam the moral support and confidence she needs to grow as a person physically, mentally and emotionally. The entire cast work so smoothly together but it is the bond between Frank and Sam that shines. The closeness and familiarity between father and daughter was captured what seemed so effortlessly between Offerman and Clemons. The dull, silly, inspirational, loving and fighting moments feel so genuine that you just want to gather together for a group hug. What unfolds is such a real story of growth of not only individuals but also the relationship between a father and daughter. Offerman known for his comedy admitted this was his biggest role to date in film but you would not think twice about it. His performance is both comedic and grounded to the fact his life is not the only one to think about. The short moments between Offerman and Danson are also great in that they may not always say much but the inflections and emotions shared are sincere between two good friends. The music as well is superb and only adds to the enjoyment of the film. Original tracks were written/performed by Keegan DeWitt with vocals by Clemons. On top of the single “Hearts Beat Loud” the other songs to look out for are “Blink (One Million Miles)” and “Everything Must Go”. In a season of multi-million summer blockbusters with CGI explosions and fast pace action we can allow ourselves to take a moment to sit back, take a breath and slowly enjoy the experience.